This is definitely not Judy's fashion style, but it might just be something her character Keisha would wear. Judy Alter spent thirty years at TCU Press, twenty of them as director, while raising four children as a single parent and writing novels about the American West. A lifelong mystery reader, she always told herself she wanted to publish one mystery and she’d be content. She now has eight mysteries in print. Learn more about Judy and her books at he website and blog. My twelve-year-old granddaughter is a fashionista. She knows how to layer, how to fling or drape a scarf just right, how to combine the unusual and have it come out perfectly. One morning I caught her dancing into the bathroom happily singing, “Makeup time.” Of course, it helps that she’s tall, thin and drop-dead gorgeous. She got none of that from her grandmother. I almost always wear stretched-out knit pants and a T-shirt when I’m home alone working; often it’s the T-shirt I slept in. In public, I try to class it up a bit with leggings and blousy tunics. But I know my sense of fashion is behind the times. I do manage makeup, though I’m no expert at it. And my hair has a cut I really like, so maybe I’m not completely hopeless. I tend to dress my protagonists—those amateur female sleuths—the way I like to dress. Kelly O’Connell, of the mystery series with her name, is a bit out of date, choosing tailored slacks and blazers for the office, a silk shirt if she really wants to dress it up. Loafers whenever she can. For dinner out with Mike, she may wear a loose, long shift—she favors beige with turquoise jewelry. At home, she wears my outfit—stretched-out slacks, a T-shirt, and raggedy slip-on tennis shoes. Her daughters are sometimes embarrassed by her clothes, a feeling I know well from my own two girls. Her style is my style—casual. Kate of the Blue Plate Mystery series wears jeans or khakis and often a white shirt under her chef’s apron, and Susan Hogan of The Perfect Coed usually wears slacks and a shirt, though sometimes she teaches a college class in jeans and running shoes. She, too, can spiff it up for dinner at an upscale restaurant, but it’s not her preferred style. One or two minor characters break out of this rather ordinary mold. Miss Lorna, the reclusive former diva in the Kelly O’Connell Mystery Series, wears embroidered Japanese housecoats with dragons on them—one even showed up on the cover of Deception in Strange Places. And then there’s Keisha, Kelly O’Connell’s capable office assistant. I think my fashion imagination went wild with her. She’s young, large (not fat, just a big-boned girl,) African American, and given to flashy outfits to match her larger-than-life personality. She wears loose tunics and even muumuus to the office, with matching high-heeled sandals (and thong sandals hidden under her desk.) If the day’s color is turquoise, her tunic, sandals, toenails, and fingernails are also turquoise, and bits of turquoise color highlight her upswept hair. She doesn’t follow fashion; she defies it. In one episode she has cut her hair into a spiky, short style—she appears with it highlighted in pink to match the flowing tunic and high heels. Everyone is stunned, and she’s a bit taken back by the reaction, but nothing stops Keisha. In a book forthcoming this spring, Desperate for Death, she buys an outrageous wedding dress and outfits for Kelly’s daughters who will be her junior bridesmaids. Kelly is, shall we say, dismayed! I would so love to have a picture of Keisha in her wedding dress. I can see her clearly in my mind’s eye. I think my fashion sense for my characters says something about my personality—going along in my own staid way but longing for an occasional something flamboyant. It’s sure fun to play with characters’ clothes. 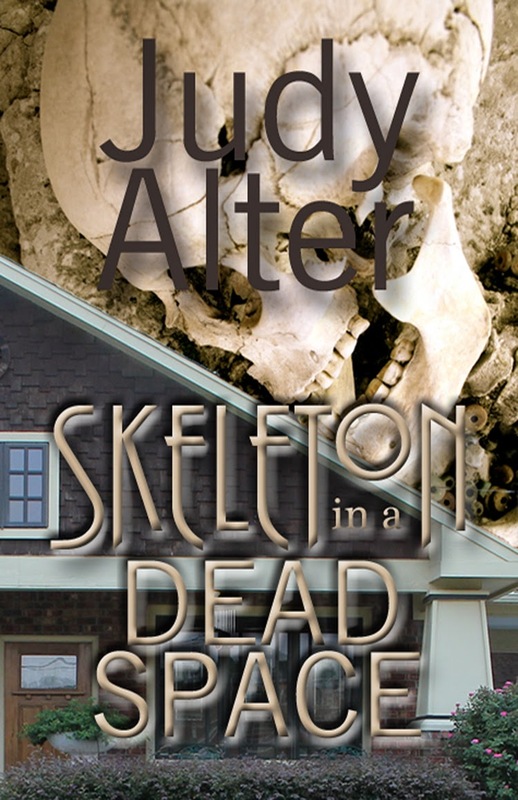 Kelly O’Connell never thought real estate was a dangerous profession, until she stumbled over a skeleton in a dead space in an early-twentieth-century Craftsman house she was transforming into a coveted modern home in an older urban neighborhood in Fort Worth, Texas. From that moment, she runs into teen-age gang members, a manipulative ex-husband, a needy and single pregnant friend, a cold-blooded murderer, and a policeman who wants to be more than her protector. As free-spirited as the chocolate-peanut-jalapeño candy she craves, Kelly barges through life trying to keep from angering her policeman-boyfriend, protect her two young daughters, pacify her worried mother a thousand miles away, and keep her real estate business afloat. Too often she puts herself in danger, and sometimes it’s the girls, not Mike, who come to Kelly’s rescue. Hi, Judy! I think it is more important to have a self style than be a fashionista. Look how glamorous we think of Grace Kelly and Audrey Hepburn. Classic. I wear t-shirts, jeans, plain white shirts, some skirts. I layer on a great sweater, jacket or scarf. But you know me, I have to have my FUN handbag. Hi Judy, loved this! I wouldn't dare dress my characters like I dress, flannel jammies and a tee or jeans and a sweater. But I dress them in what I'd like to wear--if I were 50 pounds lighter and forty years younger, LOL. Skirts and silk tops for Amy Hobbes, the newspaper editor, and high couture for Maxie Gwenoch, the magazie VP who hangs around with vampires in The Kandesky Vampire Chronicles. Thanks, Vicki and Michele. I do think it's important to have a style. But I don't aspire to be Grace Kelly or Audrey Hepburn. At my age, I put comfort before style, haven't word a skirt but a few times in years. I find in so many ways my characters reflect me. Clothes can be costume, comfort, and/or camouflage, it seems. For me, comfort usually wins out. Thanks for making me think about this more, Judy. I will have to add more clothing detail in my current WIP. Enjoyed the post, Judy! Thanks!! Susan, glad you can't see me now! But its snowing and cold, and I'm comfortable. Elaine--no pictures in books but if I ever get someone to draw Keisha, I'll put it on Facebook. Really not like the picture with this blog--more flowing chiffon, and of course a big girl, as in oversize. I tried to post a comment yesterday but couldn't sign onto Blogger. Clothing can tell more about a character than written description. My series character dresses like a slob at home but he cleans up nicely in public. He's a former teen idol and for his concerts he wears tight leather pants and glitter shirts cause that's what real teen idols of that era wear (I have photos of Bobby Sherman in such an outfit!). In my last book I put him in a tux, which he hates, and he went to a costume party dressed as Robin Hood. Now that's style! Now I'm looking for an excuse to put him in a kilt.